Psytronik Software presents a debut C64 release from Stephan Katteneder with music by Saul Cross. 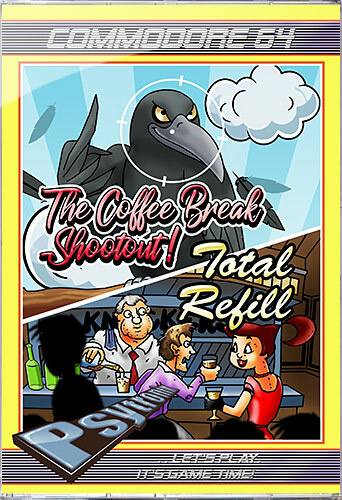 Stephan has put together two quality titles, the first of which is THE COFFEE BREAK SHOOTOUT, a slick twitch-shooter featuring gorgeously animated birds to shoot from the sky. The second game in this twin-pack is TOTAL REFILL, A Tapper-esque pump 'n' run game where you play the role of a hapless bartender trying to keep thirsty patrons happy by supplying them with copious amounts of beer! While away your coffee breaks by blasting the birdies as they majestically flap their way across the screen in this fun target-shooter. Line up your cross-hair sights and get your timing right - or the bird will mock you and fly away to survive another day. Try to beat your last score before the timer - or your coffee break runs out! Take control of Chris, a down-on-his-luck bartender who is trying to impress his new boss by looking after the thirsty patrons of the Knocker's bar. It's a bit of juggling act as you refill your pitcher, keep your customers glasses topped-up and change the barrel when needed - but it's all in a day's work as you keep your customers happy when they demand a TOTAL REFILL!